Of the vaunted Big Four of thrash metal, Anthrax just might be the band that's aged the most gracefully over the last thirty-plus years. Often viewed as a forgotten little brother of sorts to mainstream metal titans Metallica and well-respected elder statesmen Slayer and Megadeth, Anthrax seemingly has more to prove with their late-career releases. After the last two albums there's no doubt they're up to the challenge. This New York-based quintet formed around the same time as their thrash brethren but instead of embracing gloom & doom, Anthrax imbued their high-energy metal with a sense of merriment, finding lyrical inspiration from comic books, movies, and Stephen King novels. Even their more serious material possesses a tongue-in-cheek quality, which for me has always made Anthrax one of the more likable bands of that ilk; they never take themselves too seriously. After a pretty radical change in vocalists in the early 90s - Joey Belladonna's clean delivery was replaced with John Bush's raspy, dark vocal timbre - Belladonna made a triumphant return on 2011's Worship Music, sounding better than he ever had during the group's heyday. Despite being in his 50s, Joey's vocals seem to be emanating from someone at least twenty years younger. Worship Music proved to be the band's strongest album since their 1990 masterpiece Persistence of Time, and one gets the sense they're having a (headbanger's) ball on this album. Anthrax had rediscovered itself after an eight-year absence and delivered a good ol' fashioned thrash metal powderkeg; rarely has an aging band shown such vitality this deep into their career. And that brings us to their latest release For All Kings. Anthrax has taken everything that worked on Worship Music (in other words, basically everything), and given the headbanging faithful more of the same. 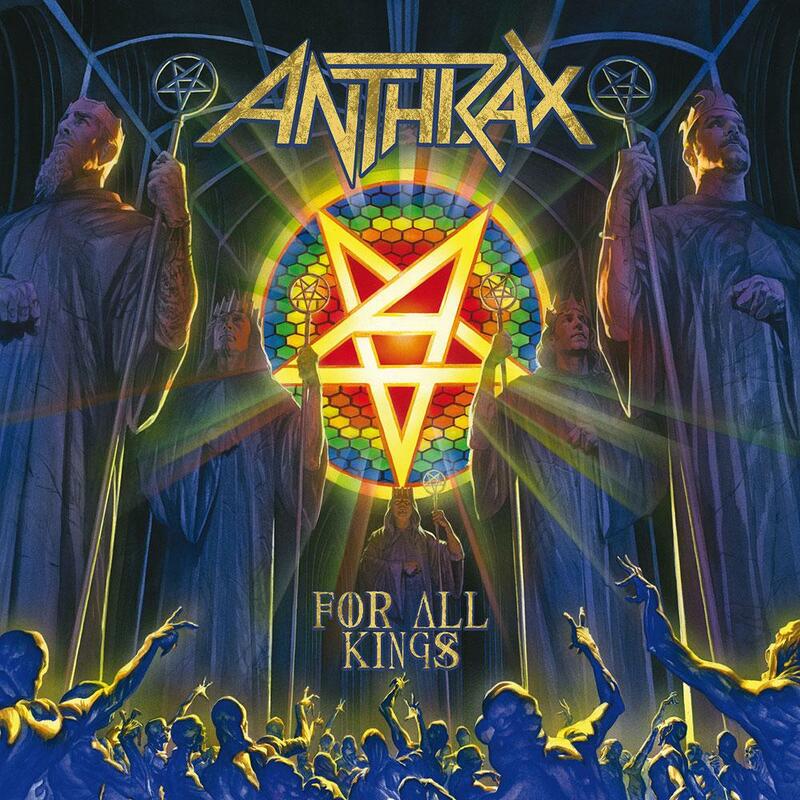 For All Kings sounds very much like a more-than-welcome sequel, with Scott Ian's jackhammer guitar riffing providing the spine of the songs over Charlie Benante's signature driving thrash beats (What a fantastic drummer Charlie is by the way) and Frank Bello's bass rumblings. Belladonna once again delivers career-high vocal stylings, and with every note I'm astonished how much better a singer he is at 55 than he was at 30. Lead guitar is supplied by newcomer Jonathan Donais (formerly of Shadows Fall), and while I do miss Rob Caggiano's distinctive touch, the solos on this album are first-rate. Being essentially a continuation of a previous album does have its drawbacks, as overall the songs aren't quite as strong this time around. But there are some real standouts like the anthemic "Breathing Lightning," an uptempo groover that feels like it bestows the listener with invincibility. This is one of Anthrax's most instantly memorable songs and would fit right in on a Best Of compilation. Other notable tracks include the breakneck opener "You Gotta Believe," the super hooky "Monster at the End," the Dio-esque title track, and the blistering closer "Zero Tolerance." For me the first half of the album sets an incredible pace which the second can't quite maintain. By track 9, the 8-minute "Blood Eagle Wings," I found myself not quite as engaged as I'd been during the first five or six tracks. However there's certainly nothing bad on this album and things pick up again with the last two songs. In contrast to Slayer and Megadeth's most recent releases, which to me sound somewhat phoned-in, Anthrax is demonstratively a band at the top of its game. Not all the songs on For All Kings achieve greatness, but the individual performers sound as good as they ever have. In recent years Anthrax has attained an ageless quality, creating speed metal that puts to shame many of their disciples and never once feels disingenuous. Of the current slate of Big Four albums, Anthrax has set the bar the highest, and the ball is now in Metallica's court to top it.